What does the vendor management food chain look like? Who has what responsibility? Where do we start? We’re asked these questions quite often. 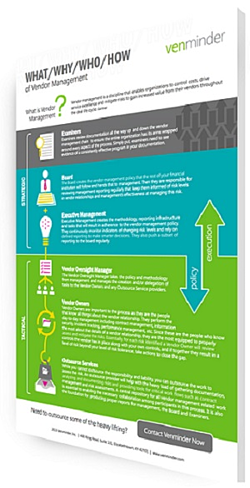 As a result, we've come up with a simple infographic available fordownload to help guide you and your team in understanding the various roles and responsibilities as you build out your vendor management program. Strategic vs. Tactical: Who does what? Policy vs. Execution: Who is responsible?